F E L O P Z D – 20/30 Vision at 30 ft… Says Who? Herman Snellen is far from a household name in 2017, in Vermont, or anywhere for that matter. That said, Dutch ophthalmologist Herman Snellen and his colleague Dr. Franciscus Donders, were unlikely to be household names even in their native Netherlands in 1862, when under Dr. Donders direction, Herman Snellen created what would go on to become as akin to ophthalmology, as the barber pole would be to barber shops: the Snellen Eye Chart. To be fair, the first known eye chart to test visual acuity is actually attributed to the German ophthalmologist Heinrich Küchler, who 26 years earlier in 1836, cut various images from calendars, books, and newspapers and affixed them to a “chart” in rows of decreasing sizes. The figures included cannons, guns, birds, farm equipment, camels, and frogs. There was an inconsistency to the style and weight of the individual images that made Küchler’s chart rather impractical in gauging a person’s vision with any measure of reliability. Dr. Küchler refined his chart some years later using 12 rows of font-heavy gothic letters in decreasing size instead of the random pictures. Still, the chart was published only once, and then largely disappeared. The world, it seemed, needed a few more years to accept the idea. It’s difficult to know if Donders and Snellen were familiar with the Küchler chart, especially seeing as how Snellen too began his eye chart experiments using various dingbats, shapes, and symbols. In Snellen’s case, this approach floundered in that people found it difficult to describe the symbols accurately, rendering the test more tedious and troublesome than it should be. In what was an obvious leap, Snellen scrapped his shapes and symbols for letters; specifically, non-ornamented, monoline, equally weighted letters of consistent visual size. These are Snellen’s “optotypes” we see today. Snellen was determined to create a universal eye chart that could reliably, consistently, and accurately measure a person’s visual acuity. 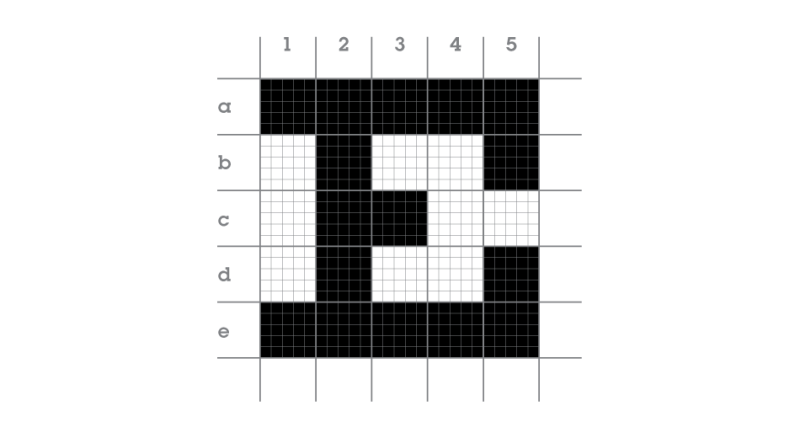 His optotypes are designed on a 5 x 5 grid, consisting of only 9-10 block letters whose height and width is five times the thickness of the line weight. 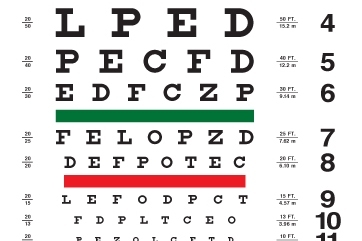 That may seem technical, but the resulting consistency in the size of each individual letter, in each progressively smaller line of the eye chart, is what makes the chart so effective. The Snellen Eye Chart is still the standard in style and substance, but more importantly it’s the foundation for all the refinements and variations that have come since. The optotypes have evolved from serif to sans serif, spacing has become more uniform and proportional, and the layout has ebbed and flowed from more dramatic, logarithmic progression (that is, the letters getting smaller and smaller in each line going down the chart), to even displaying multiple “words” on any one line; if you can call “HNORC ZSVDK” words, that is. As the study of ophthalmology itself has evolved, and our understanding of vision and the inner workings of the eye are significantly more nuanced today than they were in the 19th century, so has the Snellen Eye Chart evolved to adapt to and accommodate what we now know. You will find an eye chart, and be asked to read the letters on one, when you visit Berlin Optical Expressions, or any other optometrist across the country, if not the world. There are few instances where such a seemingly simple development is credited with forever changing the way any discipline is conducted, but for the field of optometry, and ophthalmology more broadly, the Snellen Eye Chart did just that. D E F P O T E C from all your friends at Berlin Optical Expressions!